Nuriye Gülmen and Semih Özakça surrounded by supporters during their vigil in downtown Ankara. Source: Onedio web portal. 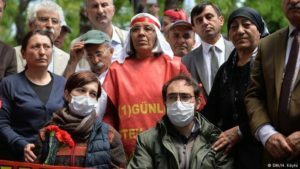 Note from the LeftEast editors: In one of the most dramatic cases of resistance against the Turkish state’s massive purges of the educational sector, Nuriye Gülmen and Semih Özakça have been on hunger strike for 110 days (as of Tuesday, June 27th), ingesting only small sugar cubes and drinking water and herbal tea. On the seventy-sixth day of their hunger strike the Turkish government had them arrested for alleged membership in a public-servants’ organization with ties to the armed militant group Revolutionary People’s Salvation Party-Front (DHKPC), in what many saw as an excuse to obtain the legal means to forcibly end their hunger strike. Gülmen was a research scholar at Eskişehir Osmangazi University in Comparative Literature, and Semih Özakça a public school teacher. They had both been fired due to their political activity, in this way sharing the fate of the over 100,000 civil servants dismissed from their posts since the July 15 coup attempt. They have pursued their hunger strike in an attempt to compel the Turkish state to give them and others like them their jobs back, and to end the continuous state of exception in force since July 16, 2016. Their decision to launch a hunger strike followed on four months of continuous demonstration on their own and others’ behalf, during which time Gülmen and Özakça came to national prominence as major figures in the resistance to the state of exception in Turkey. 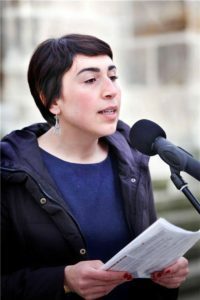 LeftEast sat down with Nuriye Gülmen’s close confidante and colleague Betül Havva Yılmaz, herself in exile in Tübingen, Germany since January 2017 as a result of her support for the Academics for Peace petition criticizing the Turkish state’s prosecution of the war against Kurdish militants in the cities of the predominantly Kurdish regions of Turkey. In the following interview with LeftEast, Yılmaz gives her assessment of what her friends’ hunger strike means for her personally, for the Turkish opposition, and for what she calls “the fight against fascism” worldwide. LeftEast (LE): Can you tell us the story of your friendship with Nuriye Gülmen? How did you meet and what have you been through together? Betül Havva Yılmaz speaking at a rally in Germany. Source: Özgürlükçü Sol. Betül Havva Yılmaz (BHY): I was appointed to a position as a researcher in the Comparative Literature Department at Osmangazi University (in the city of Eskişehir, not far from Ankara) in August 2011. Six months later, in February 2012, Nuriye received an appointment to the department. In this way we became department colleagues. Yet our friendship developed far beyond such collegial ties. We were often together, and frequently ate together. We wept together and laughed together. Perhaps the most important thing that bound us was the way we struggled together. First of all, we faced various problems in our department from very early on. Because we came out against repressive measures imposed on researchers, we were exposed to serious bullying by some professors in the department. We faced this bad treatment together. Then in June 2013 the Gezi Park resistance broke out and we took to the streets together. At all the demonstrations, all the public forums we were always together. We resisted together. At the time of the Gezi demonstrations the university began formal disciplinary investigations against us. We faced one investigation and disciplinary measure after another. We objected to our penalties, appealed them in court. We held press conferences and organized demonstrations. Always side by side, always together. As we struggled together we formed a closer bond, became as sisters, more than simply friends. I can truly say that throughout our time in Eskişehir we went through everything together, both the sweet and the bitter. LE: One would think that the department where you and Nuriye Gülmen worked, the Comparative Literature Department at Eskişehir, would be a place amenable to the development of a cosmopolitan sensibility. Was that the case at Osmangazi University? BHY: Absolutely not. If what you mean by “cosmopolitan” is universal thought or an international perspective, then I can tell you that in that department the dominate stance could not tolerate even local differences, let alone worldwide ones, nor could it permit differences of opinion. To give the simplest example: just as they would not accept Nuriye’s and my political views and activities, they did everything they could to make sure that we could not continue to work at the department. We know that an assistant professor personally spied on us for the police, following every step we took and reporting on it to police headquarters. They pursued every path to have Nuriye fired. In 2015 Nuriye lost her job because she was not able to file her master’s thesis within the time allotted. But in fact she finished writing the thesis on time, only her advisor expressly failed to read it on time and did not sign the necessary forms. It was the university administration along with other professors in the department who made the advisor do that. That was his own testimony…so you can forget about developing a cosmopolitan sensibility, as I don’t think there was even the simplest freedom of thought and expression in that department. LE: In the end you to were fired and left Turkey for Germany. What was the reason for this and what else has happened to you since you lost your job? BHY: In January 2016 I signed the text titled “We will not be party to this crime,” composed by the Initiative of Academics for Peace. I signed this text because it exposed the state terrorism being practiced in Kurdistan. After that Erdoğan declared us who signatories traitors to our country, because of what was written in the text. And on his personal orders both the Istanbul Prosecutor’s Office and our university opened investigations. Some universities, both public and private, chose not to extend signatories’ contracts and thereby terminated their jobs. Yet because there was no criminal offense in what we did the investigations could not end in us losing our status as public servants. With the investigations ongoing, the coup attempt took place and a state of exception was declared. (With parliamentary power suspended and the AKP cabinet now able to rule the country by decree—ed.—,) the decrees that followed expelled the Academics for Peace, a portion at a time. I myself was fired as a result of decree number 686, released on February 7, 2017. Actually I did not move to Germany only after being fired; that would have been impossible since being fired also meant having your passport canceled, so I would not have been able to get out of the country. One day I just realized that I too would be fired so in January I left for Germany. In fact one month later I really was fired. By the time that happened, I had already been trying to build a life here for myself anyway. To that purpose I continued doing the things I had been doing to date. Here I have recommenced my doctoral studies. I applied for a scholarship so I could get by, and I tried to get used to being here. Oh, and once I was fired I also took a placard in my hands and got out in the street. For over a month I carried on this demonstration every day. I have called people to solidarity. Now I demonstrate one day every week in the town square (in Tübingen—ed.) and one day in front of the university library. At first I referred to my own condition to call for solidarity against the fascist dictatorship now ruling in Turkey. But for some time now I have been holding a sign explaining Nuriye and Semih’s condition and telling everyone about them and their resistance struggle. I can say that in the city where I now live a network of solidarity has come into being, and recently an official solidarity alliance has formed in the city on the initiative of German labor unions. LE: How do you evaluate your experience in Germany? Can you tell us a bit more about whether you and others like you have received the help and solidarity you need? BHY: There are a lot of Academics for Peace in my situation in Germany. In fact the Academics for Peace Foundation in Germany is being founded as we speak. Especially here, in Germany, we as a group have been able to develop a very strong solidarity amongst ourselves. Aside from those like me who came here because of the most recent developments, people who have been here for a long time and established lives here, whether as academics or in other professions, have provided very valuable solidarity. 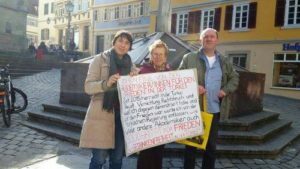 Betül Havva Yılmaz in the square in front the church in Tübingen with two German allies holding a sign for the academics dismissed because of the piece petition. Source: Schwäbisches Tageblatt. Apart from our own internal solidarity, I should also report that foundations in Germany have done as much as they can so that students writing doctoral theses can get scholarships. For example, I am a Rosa Luxemburg Foundation scholar and I cannot go without saying how grateful I am for the flexibility and understanding that they have shown. Besides, I want to express in particular how wonderful the interest and support that I’ve gotten from the people in Tübingen in the course of the personal demonstrations I mentioned above. We held a rally in Tübingen for democracy and freedom of speech in Turkey, called for by the organization of labor unions DGB. Aside from that demonstration, at a May 1 rally, at the Easter March and at several other demonstrations and press conferences our right to speak got special recognition. Spaces have opened for us to document what is happening and call for solidarity. LE: Let’s return to Nuriye. It cannot have been an easy decision to go on hunger strike. At the same time, it is not a tactic that everyone can understand. In your view, how did Nuriye make this decision and what are its goals? In reality Nuriye started thinking about engaging in resistance, about organizing a network of struggle, even if not precisely through this kind of action, much earlier than all of this. First in Eskişehir and then in other cities, she knocked on the doors of many labor and democracy forces, foundations and individuals. She called us all to a struggle which we were to organize together. This call was not a call to launch a hunger strike, but a call to come together and think about, plan and carry out a plan of action. Yet none of us listened to this call, and what a shame that is. Things being like that, she got up with a sign in her hand and started the vigil on Yüksel Street (in downtown Ankara—ed.). I think Nuriye’s main purpose was to show us that under every conceivable repression we can go on resisting, pursuing our struggle with fascism: can and must. I think she has more than reached that goal. During a state of exception in which we had canceled all of our demonstrations she alone carried on on Yüksel Street, getting detained by police over and over again. Then Semih too joined her. Through their own praxis they have exposed the quiescence, the passivity of many a leftist organization. They want an end to the state of exception, and job security for all education and science workers, including the 13,000 researchers who have been stripped of their tenure protections. These demands, made public at the very beginning of their protest, show that Nuriye and Semih are not just carrying out this struggle for themselves but for all of us. Their hunger strike began about four months later. During those four months Nuriye and Semih made press announcements from that spot every day, calling the people to make resistance their own and struggle together. They collected signatures and addressed them to the authorities. But nothing came of it. For that reason they moved on to another tactic, delivering their bodies to hunger. As a lawyer friend of mine points out, a hunger strike definitely has an addressee: in this case it addresses the state. They demand that the state recognize their rights. Yet at the same time it speaks to our conscience. In this way it tells us that we must go on fighting. In this situation it falls to us to give ear to this call and raise our own struggle. Every one of us must be a part of this struggle, wherever we are and in whatever way is open to us. We have been made slaves to this dishonorable system, our right to live as human beings has been taken from us, so what do we have to lose that could be more precious than that? LE: On the day that Nuriye Gülmen and Semih Özakça were arrested, many of their supporters have expressed their fear that the state would force-feed them in prison. From what you say I understand that as a close friend of Nuriye, you are defending her right to die in the name of political and ethical principles. Do you find this difficult, emotionally speaking? BHY: I had the same fear that they would force-feed them. I am still worried about it. Force-feeding is torture, a crime against humanity. I absolutely do not find it acceptable. When Nuriye and Semih were taken into custody, our law professor Kerem Altıparmark evaluated the case. Professor Altıparmak said that there was no legal justification for forcing people not under arrest to stop a hunger strike, that the laws could permit such an intervention only in some circumstances in prison. I say “could in some circumstances” because according to Prof. Altıparmak’s statement there is no unconditional permission to force-feed hunger-strikers. This juridical evaluation only worried us further, since we know the massacre-filled history of the Turkish state. We knew that the state could slaughter them without blinking an eye. How long has it been since the “Return to Life Operation” after all? And yes, as a close friend of Nuriye I respect her decision. This topic is very controversial. People expected Nuriye and Semih’s friends and loved-ones to try to persuade them to call an end to the hunger-strike. I for my part did no such thing. This has nothing to do with finding these tactics to be the right ones, celebrating death or making them into epic heroes at the expense of their lives, in the service of an ideology. What we see here is simply a very strong will. I for my part believe that the solution was not to be found in an attempt to convince them to stop (which I knew, knowing them well, was not possible), but rather in an uncompromising revolt. 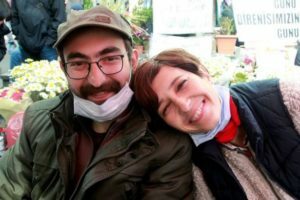 LE: The oppositional newspapers are reporting that Nuriye and Semih’s health is deteriorating and that prison “security” is turning away medical assistance. Is there anything more that you know about their condition, and which is not being reported? LE: Have you noticed changes in your own life due to Nuriye Gülmen’s influence? How has your friendship with Nuriye changed you, your principles, inclinations or how you live? BHY: How could I not notice her influence? I was shaped made-to-order in the state’s strongest ideological apparatus, the schools. I looked up to academia, had the greatest respect for the profession of “professor.” I more than merely respected professors, rather I thought that everything that professors did was for the greater good of their students and researchers. The exploitation of labor that has become so destructive today in academia and even led to suicides, the denial of people’s rights, all of this immorality I just did not want to see. With time, while still a master’s degree student at Aegean University (in İzmir—ed. ), I began to notice some problems but I did not think that I could change any of the corruptions that I was beginning to take note of. This lack of faith, this mistaken pessimism of mine regarding my ability to change and give direction to things drove me to hopelessness and torpor. I could not stand it much longer and I left Aegean University. The landscape I faced later was no different. I suffered from a learned, an inculcated despair. Whatever I did not accept about academia, I thought I would be able to correct it one day when I myself became a professor. I was more focused on responsibility for myself than anything else. But later I met Nuriye and came understand through experience that there were actually many things that could be done, that must be done. Beginning where we were, we could bring this rotten order crashing down around our heads! It was with her that I began to examine and change my accustomed ways of acting. More than anything, I learned from her not to doubt that I am in the right and not to give up on those things that I know to be my right. I always say this: a revolutionary begins by changing a single person’s life, and Nuriye changed not only my life but the lives of everyone she has met. Everywhere she went became a place full of folk songs, flowers and principled and passionate resistance. LE: In your view what can people outside of Turkey do for the academics who have lost their jobs, and more generally for the oppositional forces in Turkey that the state is trying to strangle? BHY: Actually those living outside of Turkey can do a lot more than people think. I think that the fight against fascism will be victorious as a collective effort of all the world’s peoples. I believe that those living abroad can contribute to the establishment of common networks of struggle. If I’m to give you an example from Europe, where I’m now living, I find the standpoint taken here on Turkey and the Middle East at its core quite problematic. Things are accepted which should not be accepted, and there are approaches that demand criticism. The more that those living in exile from Turkey make close contact with the peoples in the places where they live, and forward to them knowledge of what we are living through from a true and revolutionary perspective, the more they can contribute to our struggle.